Jian Bland is Director of Community Youth Services for New Brunswick Tomorrow. You can learn more about her here. Stay updated on Jian's work for New Brunswick via Twitter. Chances are, if you’re both a New Brunswick resident, and a soccer enthusiast, you’re familiar with the Bobadilla Soccer Academy. Supported by New Brunswick Tomorrow, NJ Department of Children and Families, and Rutgers Community Health Foundation, the Soccer Academy blends the very best of intentional design and physical activity. While the mornings at camp are spent honing soccer techniques and developing team building strategies, the afternoons are focused on age appropriate workshops designed to engage campers in relevant topics centered on their individual journeys, their community, and their interests. Additionally, an element of the Academy is focused on teaching the importance of community service and volunteerism. Each age group works on a community service project and dedicates time and effort throughout the 5-week duration, to give back. This year’s projects included: a community car wash that raised $450 for the Bristol Myer's Squibb Children's Hospital; hand-written letters to officers in all branches of the military; a litter clean up collaboration with the Department of Public Works in a surrounding neighborhood, collecting over 265 pounds of garbage alongside Mayor Cahill and New Brunswick Police Officers; a food and clothing drive to donate to a local family that lost their home in a house fire on July 13th; placemats for meals on wheels; goody bags, gifts and thank you letters to school security guards for keeping the camp safe; a collection of food donated to Elijah’s Promise; a lunch with senior citizens from Parker where hand-made floral vases were given to each guest; and book bags with letters of encouragement for children of domestic violence victims at Women Aware. 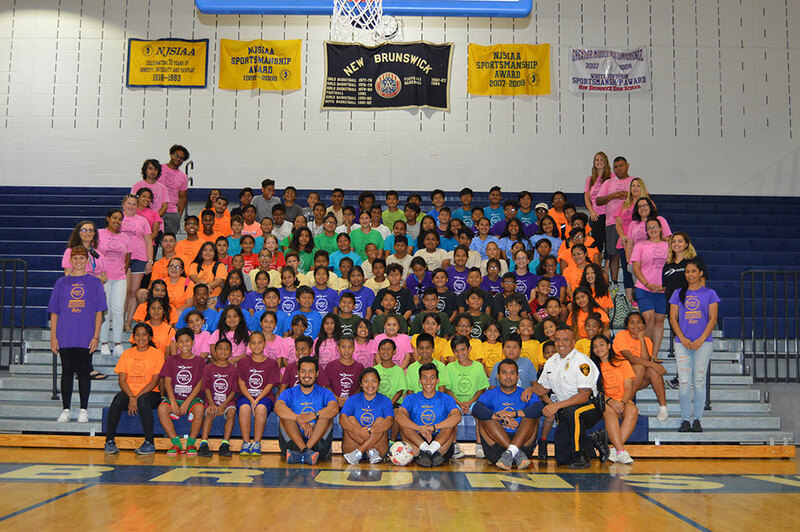 By working to instill the value of service into the campers, and encouraging engagement with different facets of the community, the Bobadilla Soccer Academy reinforced youth development on multiple levels. Heartened by the enthusiasm demonstrated, we encourage campers, counselors, and parents alike to continue to find meaningful ways to engage the community, particularly as the leaves change and the weather gets colder. We look forward to seeing familiar faces at the Bobadilla Soccer Academy next summer!